West’s Eden Cline shoots during the second half of Monday’s 56-42 loss to Waverly. Waverly’s Kami Knight drives to the bucket during the first half of Monday’s 56-42 win over West. West’s Emily Sissel led the Senators with 13 points in Monday’s 56-42 loss to Waverly. Waverly’s Zoiee Smith shoots in traffic during the first half of Monday’s 56-42 win at West. 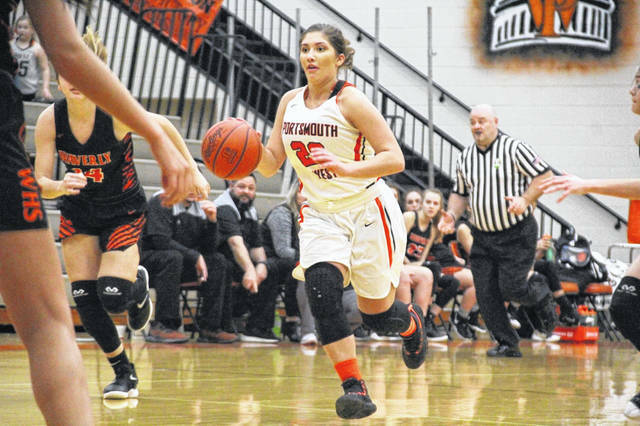 WEST PORTSMOUTH — When Kami Knight drives to the bucket, she’s really, really effective. Waverly’s senior forward made a habit of getting to the rim Monday evening, slicing through West’s defense like knife through butter. The result was a game-high 24 points, a scoring total that paced her Tigers to a 56-42 win over the Senators in SOC II action. The Tigers (12-7, 6-6 SOC II) fended off a West lineup that featured three freshman starters in Abby Adkins, Eden Cline and Leah Bolton. While the Senators (3-16, 1-13 SOC II) may have found themselves on the wrong side of the scoreboard Monday, the future is obviously bright. Part of the reason those Tigers were so tough was the play of both Paige Carter and Zoiee Smith. 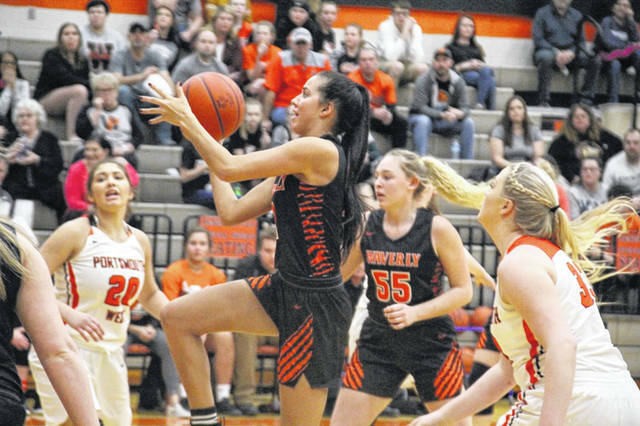 Carter pieced together a usual night for herself, scoring nine points and grabbing 11 rebounds, while Smith tallied nine points, five boards and four assists. West took an 8-2 lead behind two 3’s from Eden Cline and a bucket from Bolton. Sandwiched in between that action was Knight’s first points before the senior tied the game, 8-8, with two consecutive baskets to cap a 6-0 run. With 1:27 left, Knight gave the Tigers their first, and the game’s last, lead of the night at 12-10 before Waverly took a 15-10 lead into the second. In the second, Waverly’s Hailey Robinson drilled back-to-back 3’s, stretching the lead to 21-12 with 6:34 to go. The Senators chipped away, cutting the lead to six at 27-21, but Smith scored twice just before halftime, putting Waverly up 32-24 at the break. Coming out of halftime, West’s Morgan Rigsby scored twice to cut the lead to just four at 32-28. Then, with 5:56 left, Bolton nailed a trey, pulling the Senators to within three at 34-31. But that was as close as West would get to a lead. Carter got a putback to go and Knight dialed long distance, making it 39-31, before the Tigers took a 43-34 lead into the fourth. Knight scored seven fourth quarter points while, putting the finishing touches on a 14-point win. Knight led all scorers with 24 points alongside eight rebounds while Carter’s nine-point, 11-rebound performance followed that up. Smith ended the night with nine points, five rebounds and four assists, Carli Knight had six points, four rebounds and five steals, and Robinson finished with eight points and two assists. For the Senators, Emily Sissel scored a team-high 13 points while Rigsby added nine points and 11 rebounds. Bolton ended with seven points and 10 rebounds, Cline had six points, and Abby Adkins scored three points and passed out a game-high five assists. West gets right back to action Tuesday evening, hosting Westfall in a makeup contest. As for Waverly, the Tigers host Washington Court House Wednesday night. Those two teams are paired together in a Division II sectional final on Feb. 14. Waverly: 22-53 FG, 9-20 FT, 3-9 3pt. (Robinson 2), 31 rebounds (Carter 11), 13 turnovers, 10 assists (Smith 4). Scoring: K. Knight 24, Smith 9, Carter 9, Robinson 8, C. Knight 6. West: 15-48 FG, 5-10 FT, 5-22 3pt. (Cline 2), 30 rebounds (Rigsby 11), 12 turnovers, 10 assists (Adkins 5). Scoring: Sissel 13, Rigsby 9, Bolton 7, Cline 6, Pack 4, Adkins 3.
https://www.portsmouth-dailytimes.com/wp-content/uploads/sites/28/2019/02/web1_thumbnail_Cline.jpgWest’s Eden Cline shoots during the second half of Monday’s 56-42 loss to Waverly. https://www.portsmouth-dailytimes.com/wp-content/uploads/sites/28/2019/02/web1_thumbnail_K.-Knight.jpgWaverly’s Kami Knight drives to the bucket during the first half of Monday’s 56-42 win over West. 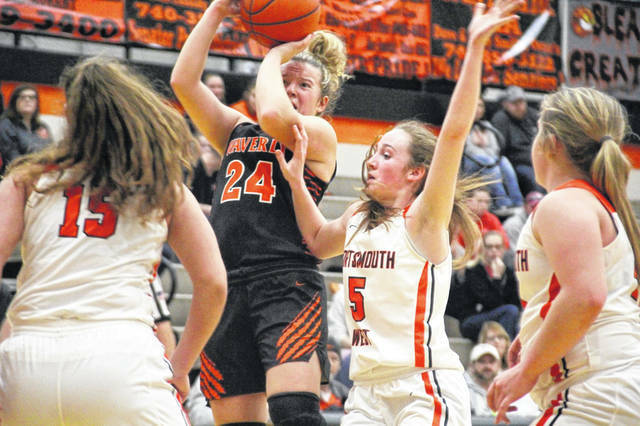 https://www.portsmouth-dailytimes.com/wp-content/uploads/sites/28/2019/02/web1_thumbnail_Sissel.jpgWest’s Emily Sissel led the Senators with 13 points in Monday’s 56-42 loss to Waverly. 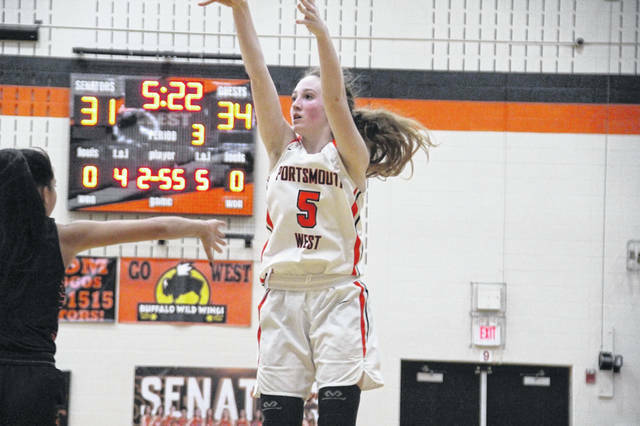 https://www.portsmouth-dailytimes.com/wp-content/uploads/sites/28/2019/02/web1_thumbnail_Smith.jpgWaverly’s Zoiee Smith shoots in traffic during the first half of Monday’s 56-42 win at West.